This recipe may sound kind of strange to anyone outside of South Texas, but Pink Grapefruit Pie is an old favorite during Ruby Red season. 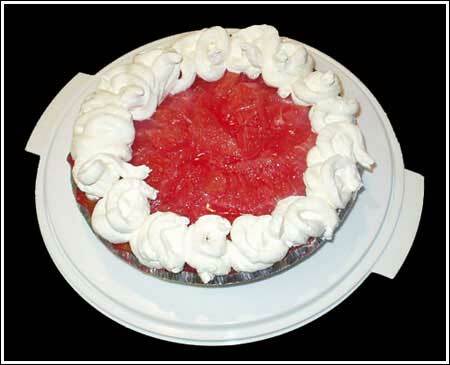 Pink Grapefruit Pie is made with a graham cracker crust, strawberry gelatin and cream cheese. Make crust first. Preheat oven to 350 degrees F.
Mix together crumbs, sugar and butter. Press into bottom and up sides of a 9 inch glass pie plate. Bake for 8 minutes. Let cool. Prepare filling. Whisk together water, sugar and flour in a saucepan. Heat over medium, stirring often, until thickened. Remove from heat. Stir in butter and gelatin. Set aside to cool. Combine cream cheese and powdered sugar and beat until light and fluffy. Spread cream cheese mixture over crust. Arrange grapefruit over cream cheese filling. Pour gelatin mixture over grapefruit and chill until set. just testing…I loved this link too, btw. thanks for posting. The credit card prank is pretty funny too :). Great site, thanks for the zug link!